Turning stale old colored paper into bucks! Do you own a comic book collection that you want to sell? Want to get the most money you possibly can for it? Well, whether you have painstakingly put together a comic book collection for the ages or you just lucked into one and know next to nothing about comic books, this six part series of articles will give you the lowdown on not only how to SELL your comic book collection but how to get the MOST MONEY for your collection. Each article will be posted daily so the whole thing will be wrapped up within a week. 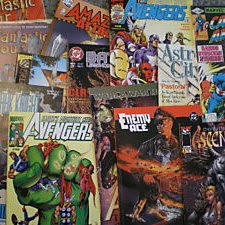 If you are a grizzled veteran of the comic collecting wars, the first three articles dealing with assessing your collection might be of little use - but a dime against a dollar you will find at least one thing you can use in the last three parts. The main thing to remember is that not all comic book collections are created equally - i.e. the value of the comic book collection can vary wildly according to several factors. Factors affecting the value of comic books are a) how old they are, b) whether there are any "key" books in the collection (more on that later), c) the physical condition of the books, d) the marketplace demand and e) the sheer number of the books in the collection. So before we get into "how" to sell your collections, we need to delve into the five factors above a little - here is the due diligence you need before selling your collection. Or Nostalgia Will Never Die! Like antiques, stamps, coins, etc., the older the better. That isn't always true - nothing really is - but the older the comic books are, the more likely they will have more value than recent, modern comic books - i.e. ones published in the last 20 to 30 years. If you are trying to sell your comic book collection, one of the people you most likely will try to sell it to are comic book dealers. Some comic book dealers deal in old books, some in modern comics and some in both. The majority of comic book dealers that sell old books deal in comic books published from 1935 to 1979. Most comic books printed in that age range vary in original price from 10 cents to 60 cents. 10 cent books were published from 1935 to 1962. 12 cent books were published from 1962 to 1969, 15 cent books from 1969 to 1970 (that didn't last long), etc. - you get the picture. From 1970 to 1979, comic books off the rack rose in price steadily from 15 cents to 60 cents. 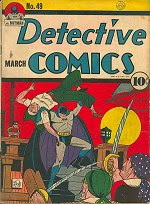 Note the Detective Comics #49 from 1941 at right - only a 10 cent price tag but in Near Mint Minus condition, this book is now worth $4200 according to the latest Overstreet Comic Book Price Guide ! We'll talk more about condition and the Overstreet guide a little later. By the way, if you don't want to purchase a copy of the Overstreet Comic Book Price Guide you can also get a free account at ComicPriceGuide.com or ComicBookRealm.com and look up the values of books online for free! The values at ComicPriceGuide.com and ComicBookRealm.com are fairly close to the Overstreet Comic Book Price Guide . Modern comic books cost anywhere from $1.00 (1990) to $2.99 to $3.99 for comics printed in the last decade or so. So a rule of thumb - a rule with significant exceptions, examples of which will be provided later - is that the older a book, the more valuable the book. Walkin' Willie's Comix on Twitter! The Bloodbath That Has Become Trade Paperbacks!